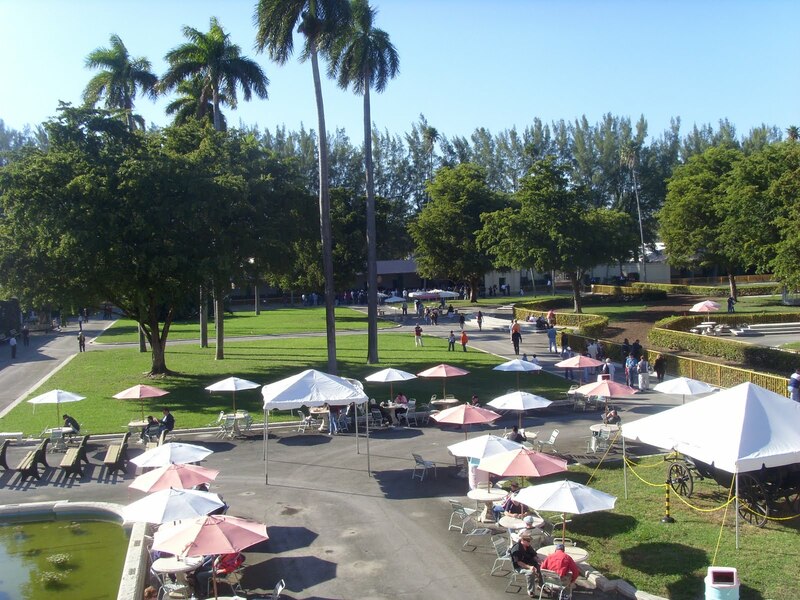 I came to racing too late to make it to Hialeah to see Thoroughbreds; the shuttered track has been presented to me as a Shangri-La, the epitome of all that was good and right and beautiful about racing. I mourned that I never got to see it. 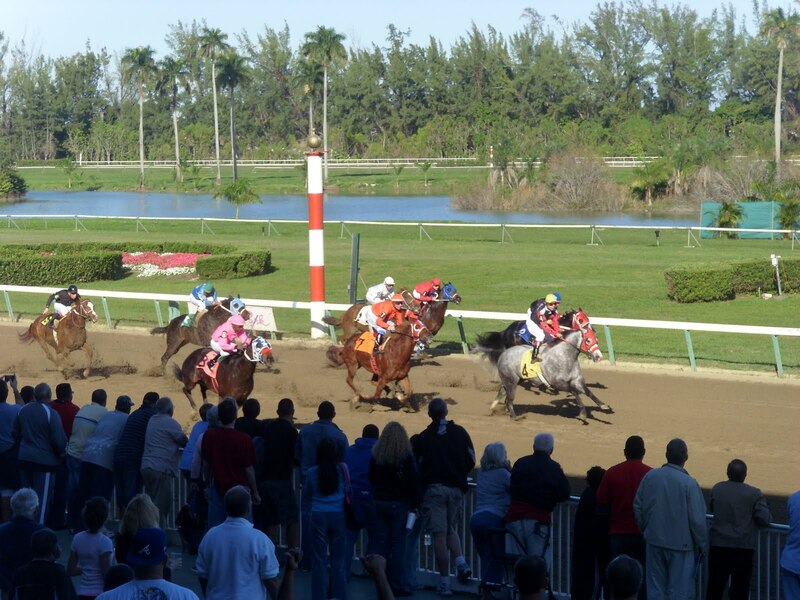 But I lucked out: Hialeah would be open for racing during my winter break, and though I know nothing of Quarter Horse racing, I knew that the opportunity for an afternoon at Hialeah would be irresistible. I thought that I might be disappointed, that I might see an old racetrack trying to be something it no longer is, to feel a little embarrassed and sad for the old place, perhaps the Blanche DuBois of race tracks, trying to capitalize on faded beauty and revive impossible dreams. Nothing prepared me for the loveliness of Hialeah. Those who knew her in younger days might feel that disappointment, but to this newcomer’s eyes, Hialeah, unlike Blanche, more than stands up to sunshine scrutiny. Cultivated nostalgia can be a little hard to take, but at Hialeah, it didn’t feel anachronistic; Hialeah had on her party clothes, and while they might have been a little out of style, they were pure vintage clothing store, not Salvation Army. 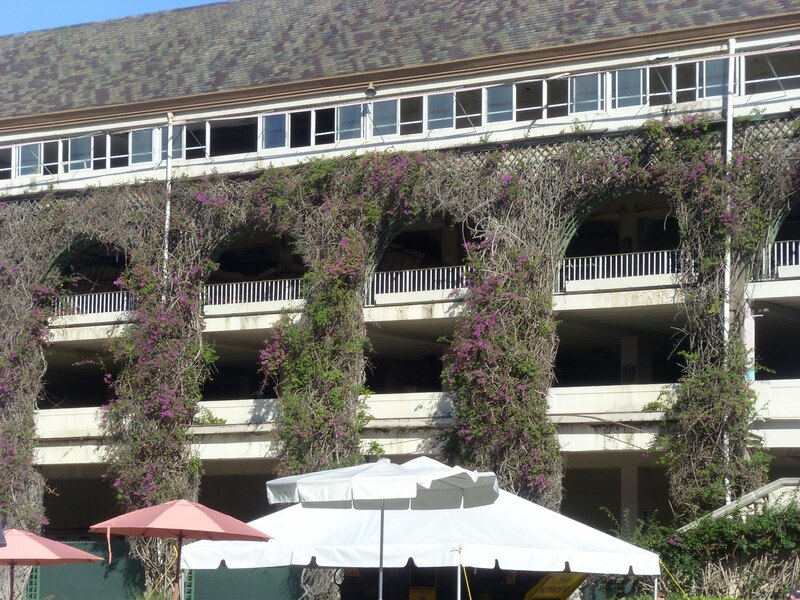 The grandstand, damaged by Hurricane Wilma in 2005, is closed, but the bougainvillea, even if faded, drapes it majestically; here, aesthetics have to substitute for utility. 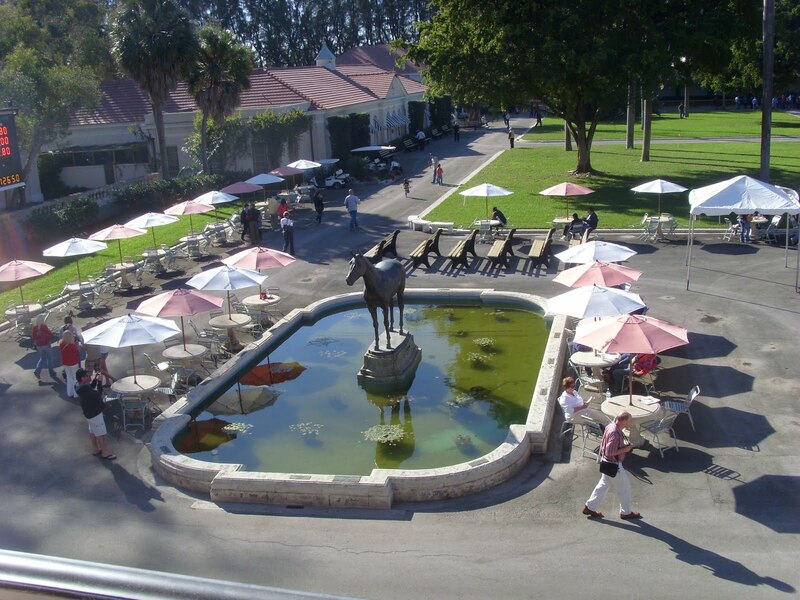 The saddling and paddock area behind the clubhouse are meticulously landscaped; Citation, winner of the Flamingo Stakes and the Triple Crown, still stands, as horses walk under the trees and visitors relax beside him. 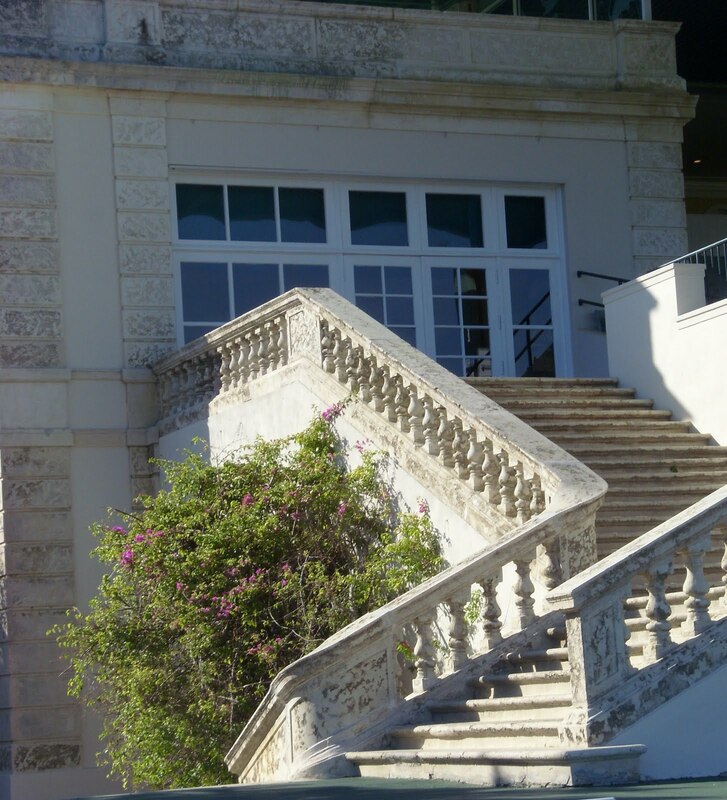 The clubhouse stands, open, in its stately majesty, wide stone stairways its architectural highlight. …outside, a small but enthusiastic crowd cheers on the Quarter Horses that charge up the stretch. She is a fan of John Brunetti, who’s brought racing back to Hialeah. “He spent so much money to get this place ready to open. Three shifts, every day.” She’s optimistic for Hialeah’s future, believing that racing will return to this storied place. 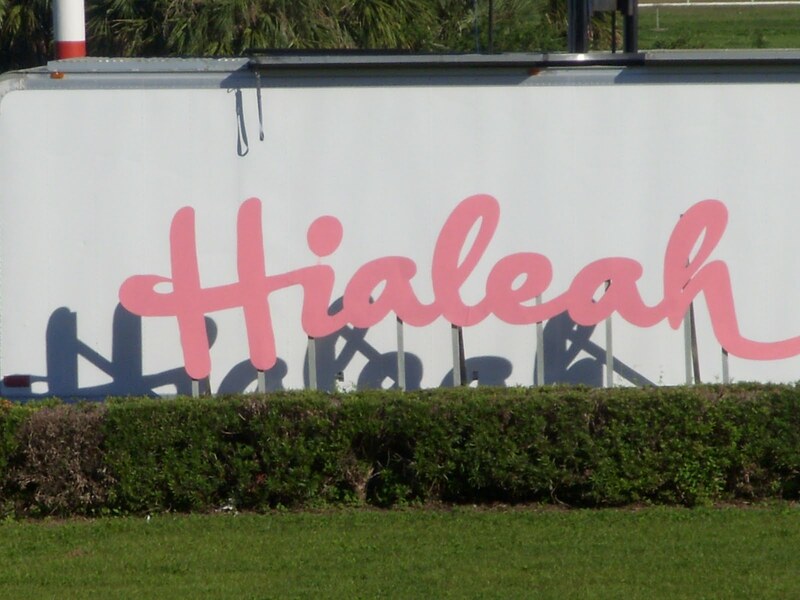 I don’t know nearly enough about what caused Hialeah to close; I know it was about racing dates and revenue and take-out and territory; I know that it was about mismanagement and bad decisions. And for Hialeah to come back as a Thoroughbred track, I know that three tracks within a half hour of each other, three independent business entities, would need to come to some sort of cooperative agreement, one that for two of the three would mean a loss of revenue. Foolishly, naively, I want to believe that sometimes, money’s not the most important thing, that surely, creative minds can figure out an agreement beneficial to all three tracks. Would, indeed, that it were so; would that the historical and aesthetic significance of this place were enough to spur people to work together to bring racing back here. 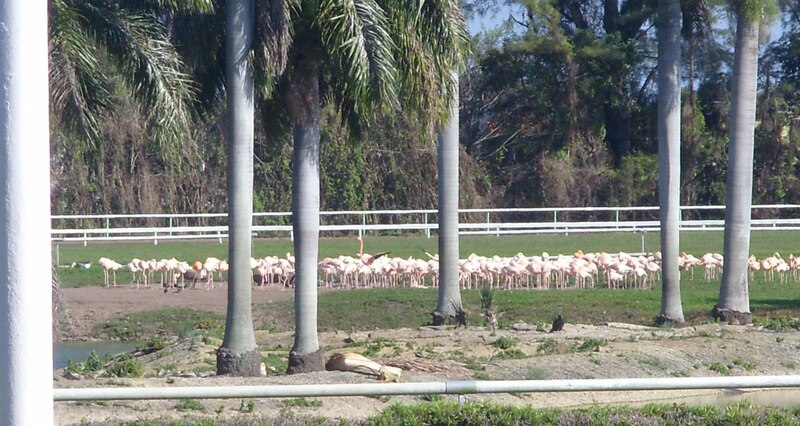 After the flamingos fly, we reluctantly take our leave, not knowing if we’ll ever make it back to Hialeah, not knowing when, or if, Thoroughbreds will ever take to the track there again. But even if this is it, and even though I’ve missed the best of what Hialeah was, and even though a few hours in this beautiful place aren’t nearly enough, it’s better, far better, than nothing…which is, at this point, the alternative. Click here for a full photo album (in which some of the above photos are included). An Open Letter to the Stronach Group From Catherine Toner: Your Racing Queens Are Right Here. Do they offer simulcasting of thoroughbreds? If I lived down there, I would be hard pressed to stay interested in continued attendance if the only product offered was quarter horses. One visit, sure. The place would be like a museum to me. But I'd lose interest quick. Wow, how lovely! I, too, have only heard stories of the TB Mecca, Hialeah. Thanks for the tour. Did you see that ESPN documentary on Jimmy The Greek? They had several shots of a racetrack and I was wondering if they shot that at Hialeah. Lovely….You're not alone in being naive and foolish when it comes to stuff like this. The value of such a beautiful place surely has to count for something.I wonder if Haileah is eligible for submission into the National Register of Historic Places. I'm sure the rules and guidelines would conflict with running horse racing, and talk about naive and foolish :); but what a way to preserve such a beautiful building. You know, Rich, I can't remember whether there was simulcasting. I was so dazzled by the atmosphere that I barely remembered to bet the races taking place there.Lucky: Even lovelier in person.Derek: Unfortunately, no. I heard it was terrific.Jennifer: Hialeah is on the National Register of Historic Places and is apparently eligible for designation as a National Historic Landmark. Teresa,What a fascinating trip back, both in time and in racing aesthetics. It was great!You happily refer to your visit to "Shangri-La"; I wonder if the word Camelot might also strike your fancy, for that is a very special place that has been asleep for far too long, for all the wrong reasons, just like Hialeah. And, conversely, maybe Hialeah should join that limited grouping of literature's ethereal beauties alongside the great ones.Really enjoyed the photograph-enlarging attribute you have now added: I don't remember it from previous postings.Your photo of Alfred Vanderbilt's silks draped upon a Hialeah chair remind me that I have not seen his cap festooned with a cerise pompon before — what a kick!Outstanding photos of the flamingos, and super video of their flight! Your talents are many.I guess that I am left with the musical memory of Broadway's spectacular Camelot, which ran contemporaneously with breautiful Hialeah in 1960; and the lyrical thought so well expressed in that theatrical treasure… "In short, there simply is not, a more congenial spot, for happily-ever-aftering, than here in HIALEAH!Sincerely hope you will be able to return to both Calder and Hialeah next year! 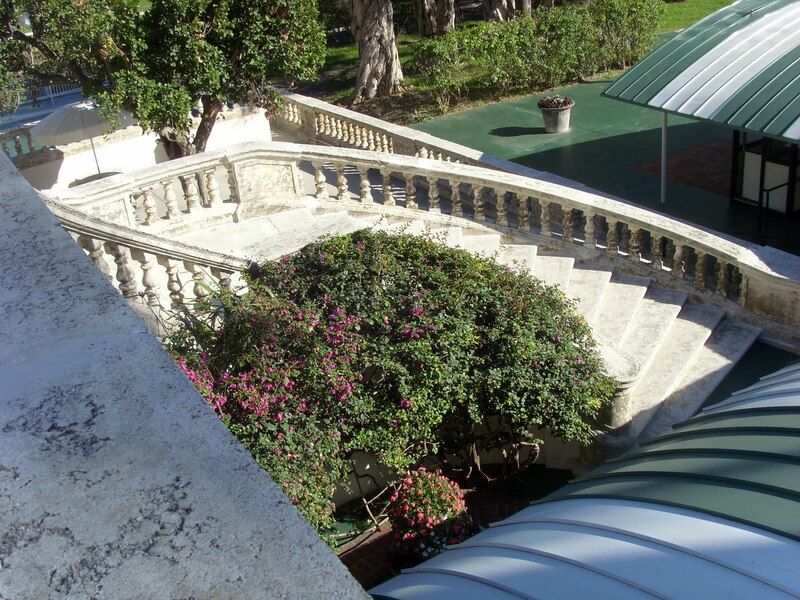 Teresa, thx for the great pics and write-up about Hialeah. Very well done!Derek, those were pictures of Hialeah in the Jimmy the Greek documentary. It must've been his favorite track but don't know why they didn't identify the track.Restoring thoroughbred racing to Hialeah would be one of the best things that can happen to the sport. But it requires cooperation among south Florida pari-mutuels. Cooperation in horse racing . . . what are the chances of that happening? Hmm…I should do my research before I comment next time. 🙂 Good news; wish they'd take that next step. Teresa – Your post brought back wonderful memories of Hialeah. It's one of my favorite places on earth. You would enjoy the book "Hialeah Park: A Racing Legend" by John Crittenden. I bought it years ago at an exhibit booth on the second floor of the Belmont clubhouse (a sticker inside the book refers to the Eclipse Thoroughbred Library of Breezy Point, NY). The credits portion on the Jimmy The Greek documentary identified the racetrack as Hialeah. Jimmy was very fond of Hialeah but officially when asked what his favorite track was he said: The one closest to wherever I am at the time. Once again, Teresa, another wonderful and colorful essay – a combination of beauty and nostalgia. It only requires a little imagination to to think of what Hialeah was like in its heyday.Curious: What causes the flamingos to fly at a particular time and where do they go? "the Blanche DuBois of race tracks'…love the comparison!Indeed, if walls could talk what a story they could tell of days gone by from old Hialeah. 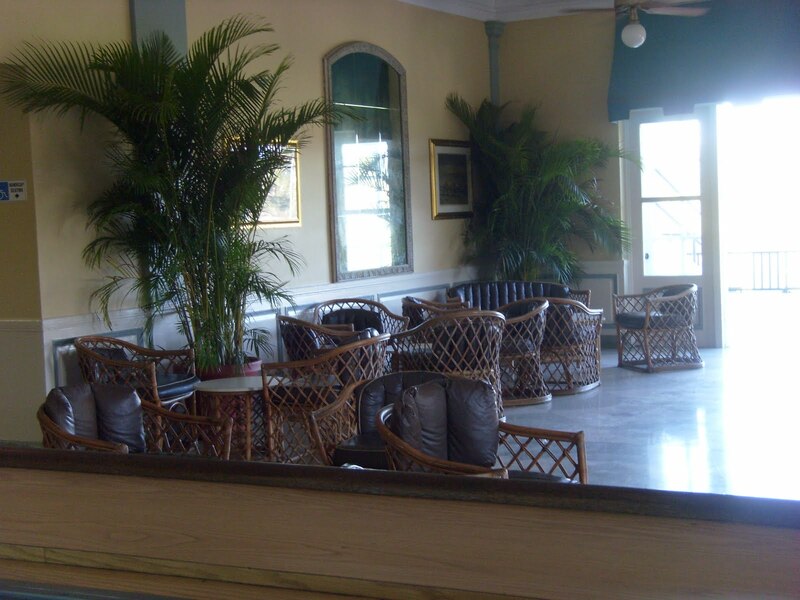 A boutique Saratoga-like meeting at Hialeah would annihilate Gulfstream, cooperation be damned. Frank's shopping mall/casino couldn't compete. Speaking of movies, if I clear a cobweb or two from the brain, I recall a very short scene in Godfather II – isn't Al Pacino driving out of Hialeah racecourse? I don't think it was a huge contribution to the plot other than to demonstrate Michael Corleone was in Florida. Thanks, everyone, for reading and commenting. Sue: Been waaay too long since I've seen Godfather II to say for sure. If you look at the photos, there's a man in the infield, so I'm guessing that he has something to do with the flight of the flamingos, which is a series of circuits around the infield. LJK: from your mouth to the racing gods' ears.Anon 8:25: Camelot, why not? And thank you for your kind words.Thanks, Steve; and thanks for confirmation on the Greek. Anon 9:56: I'll be looking for it!BSaint: I knew you'd like that one.TKS: Thought of Let It Ride more than once while I was there–that film is a desecration of the place!Joe: what can I say that you haven't already? 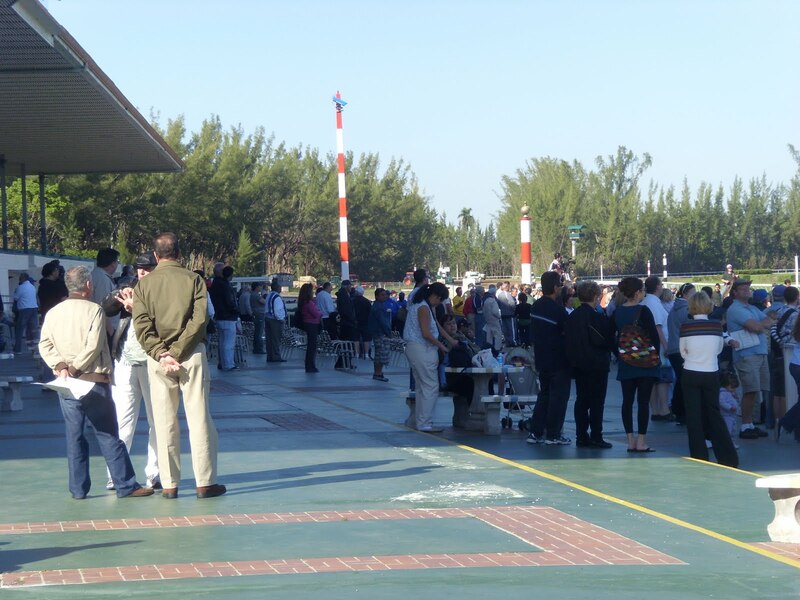 No simulcast at all is held at Hialeah. They can, and do send out their signal but can't receive signals. 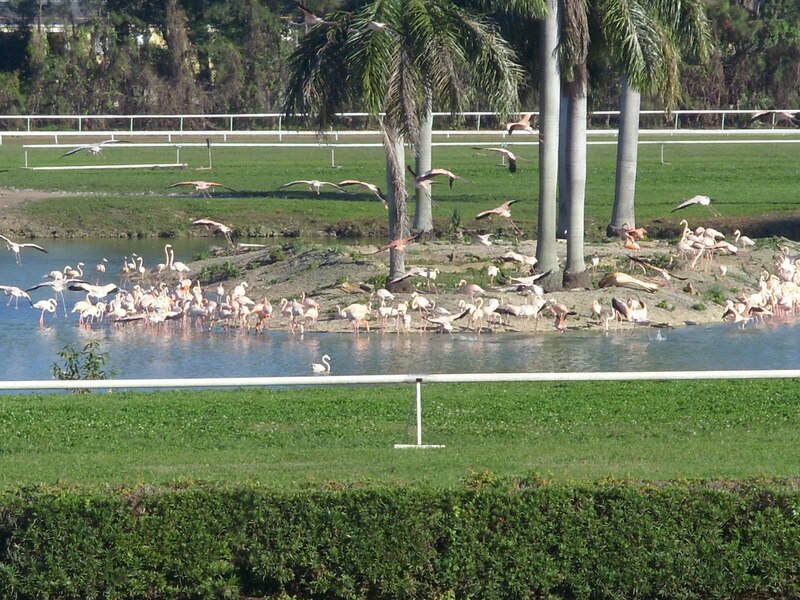 As for the flamingos, they have people that go out on the track after the 4th race to stir them up and then the flamingos fly around the infield pond for a couple laps before they settle again on the islands. Although they have had problems getting them to fly last week due to the cold! Can't say I blame them! 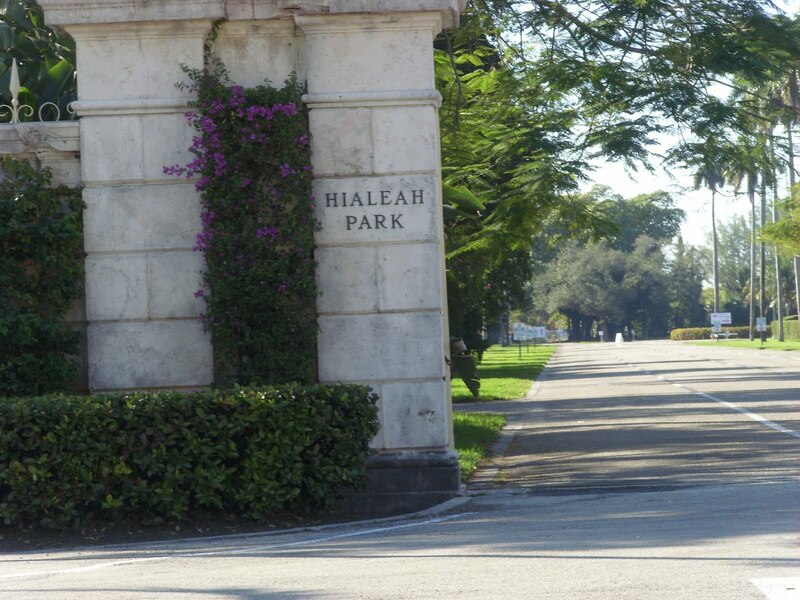 Hialeah is a gorgeous track and I hope an agreement can be made to bring back the Thoroughbreds, but they did a great job restoring it for the QH's. Thanks for posting this.I do remember the glory days, when Hialeah was NYRA South.I am sorry that they will be closed again by the time I get down to South Florida and I will not be able to have a look myself; and just as sorry that Gulfstream will be racing. They cannot go out of business fast enough for me, especially now with their "new paradigm of racing." Movies at Hialeah. Both the remake of The Champ and Let It Ride were filmed there and I was lucky enough to be there when they were filmed. Funny but true story on one of them. (I think it was The Champ, but don't hold me to it. Old Age you know. LOL!) One of the horses used in the filming was a horse named Idle Terry. The trainer, a red headed lady (again, the name escapes) was stabled in the next barn from us. She had been trying to get the horse a workout on the grass to see how he would handle the going but hadn't been able to do that due to the usual wet grass weather concerns. When they started to look for horses for the filming, she jumped at the chance because the filmed race was going to be on the grass. Well, she got her workout, over and over and over! After the filming was over, she entered the horse at Calder in a grass race. On paper, the horse was way over it's head in class. If memory serves, the horse paid something like $129 to win. I had the Tri, exacta and $100 to win on him Easily the biggest score I have ever made to this day. One other Hialeah story. Very true and still ongoing to this day. (This because I've been jolted into taking a walk down memory lane). I was rubbing horses for F.B. Lantz, lovingly referred to as my old man! He was assistant trainer for P.G. Johnson for some years then went on his own. 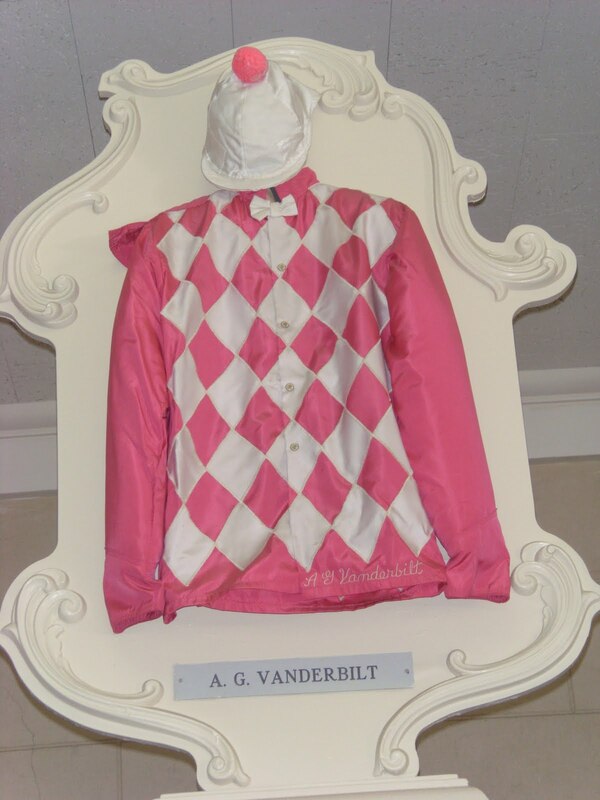 Raced mainly Chicago and Fla. We were always stabled in Barn 11 at old Tropical and shipped in to Hialeah to race. The recieving barn was on the south side of the stable area and there are railroad tracks next to the road (if memory serves). And yes, the guy (me) was and still is a racetracker, albeit in a tote system capacity. When I met my wife, she was a ticket seller at Miami Jai Alai and I was worlking for Autotote. I went to my selling line opening night at Miami Jai Alai and she was on the first machine. The first thing she said to me was “Oh my God, it’s you!” I looked at her weirdly because I had no idea what she was talking about and quite honestly had never seen her before that nite, or so I thought. She then went on to tell me the what she called van story. Sue would be walking home from school with her friends and always walked by the track next to the recieving barn ramp. One day as they were walking by, she saw a kid hanging from a van eyeing her. She told her friends ( and to this day, they claim this is true) that she would marry that guy someday. She also said she had told her friends she would someday work at the track, which she did in both a seller and a tote capacity. So in many ways, the Grand Dame that is Hialeah delivered the greatest present I have ever recieved. Thirt five years later and I still can't believe it.My bottom line is as I stated earlier. Worn down facilities, etc. can be repaired as is evidenced by youe fabulous pictures. And don’t forget. I’m pretty sure the Metro Rail or whatever they call it stops at the track. Raising Hialeah back to her rightful place is in fact a doable thing which I believe can happen.